My dad’s bowl of bún thịt nướng earlier this week inspired me to find my own. After all, this perfect combination of grilled meats, pickled carrots and daikon, rice vermicelli, and flavor packed herbs is hands down one of my favorite meals in Vietnam. At a dollar a bowl, I find myself going back to the old lady behind my apartment over and over again. She has perfected her craft and I could drink the side of nước chấm by the gallon. The tiny barbecue grill only inches from her seat delivers the most delicious and tenderly soft meats in our neighborhood right into my awaiting bowl. Yes, the bún thịt nướng lady has set a high bar for anyone who dares follow. When I entered a deli called Viet Tofu at 4897 Buford Highway in Atlanta on my Great All American Bún Thịt Nướng Search, I momentarily forgot I was actually in the USA. All the familiar food selections and smells transported me right back to Saigon. Reality slapped me in the face though when a young Vietnamese women busy on her IPhone ordered a sugarcane drink in perfect unaccented English. The young Vietnamese guy behind the counter answered back in perfect English as well. I got to thinking these must be 2nd or 3rd generation children of immigrants. I don’t know why I was surprised since that would be like expecting me to speak Russian. Perhaps two years of living in Vietnam has caused me to always assume Vietnamese will be spoken around me. 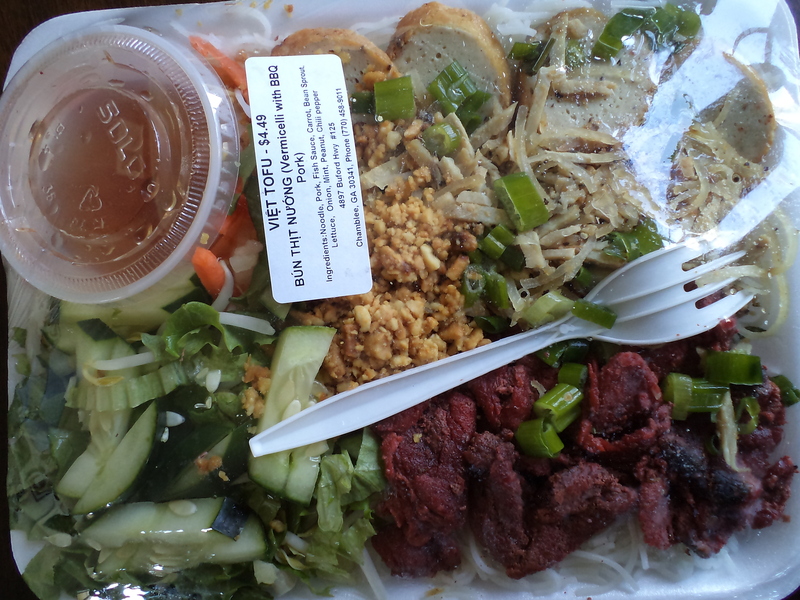 A prepacked plastic wrapped tray of bún thịt nướng resting on a table had my name written all over it, and at $4.49 was a few bucks cheaper than my dad’s restaurant version. However, it was still $3.49 more than the breakfast lady’s and didn’t quite look the same. I dumped it onto a plate, mixed it up and dove right in with high hopes. As it turns out the only similarity this meal has with its Vietnamese cousin is the name. From what can or bottle the meat derives its reddish tint I will never know, yet no color in the world could render these largely flavorless strips any less chewy. In Vietnam a sweetness permeates the smoky outer layer of properly grilled meats, but here salt seems to take center stage. And what’s with the uncustomary pork sausage slices that seem to take the place of the customary sliced fried spring rolls. I am not saying it tasted bad at all. Actually for American standards it is passable. For the second time in as many days, some seriously off kilter nước chấm offended my tongue. No wonder fish sauce strikes fear in the hearts of any American who tries it. This mess is all they know. The nuoc cham dipping liquids made from it over here are bitter and salty enough so as to be inedible. Such is life. 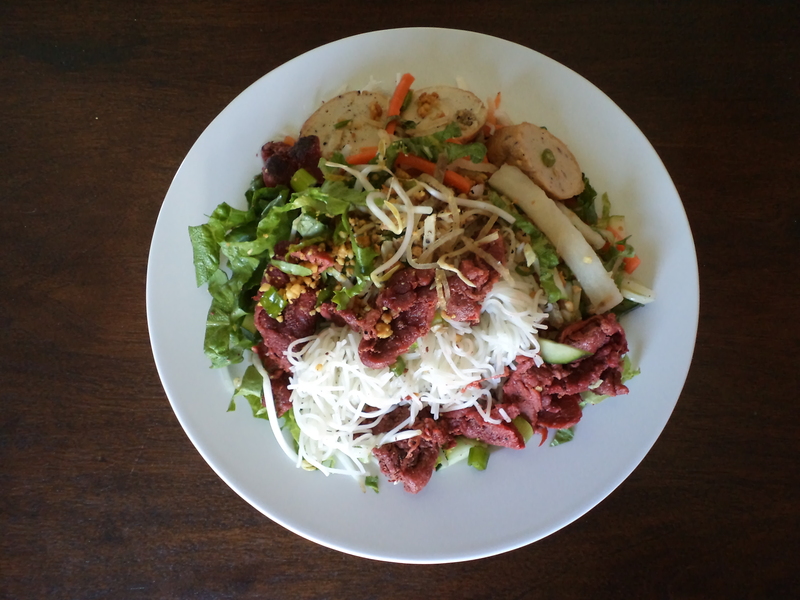 Isn’t it ironic that good western food prepared by Vietnamese hands abounds in Saigon, yet in Atlanta Vietnamese-Americans prepare interesting takes on their own native cuisine. Bún chả is next on my list of items to sample, and I asked the workers at Viet Tofu where a decent meal of it can be found. They looked at each other and finally whispered a restaurant name across the counter as if they were sending me into some sort of illicit red light district. Stay tuned for our next installment of Why Doesn’t This Taste Like Vietnam?